1. Literal Sanskrit translation: great seer. Maharishi has been extremely influential in the acceptance of camouflage in streetwear fashion over the past decade or so. At Laundry, we have been huge fans of the label for many years with its eco-friendly philosophy, Maharishi was dubbed “Streetwear Designer of the Year” at the British Fashion Council Awards. Aside from the cameo trademarks of Maharishi, Creative Director Hardy Blechman who founded the label in 1994 had a vision to create environmentally sound, fair-trade produced, long-lasting, high-quality, utilitarian clothing. The collection has always included the strong natural fibre hemp as well as organic cottons and upcycled military clothing. 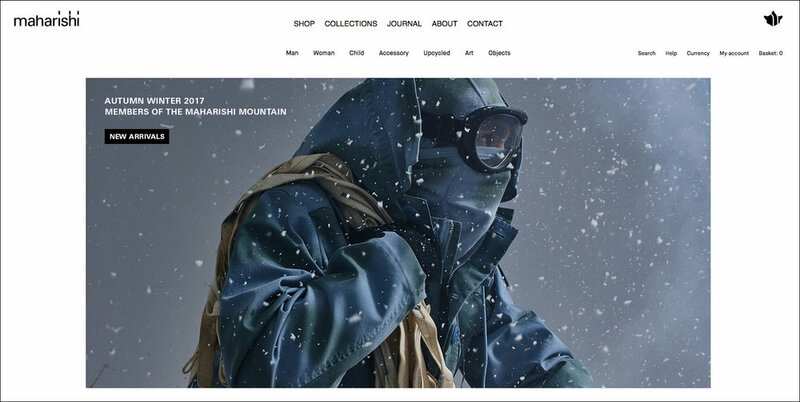 Maharishi remains a privately owned company, and maintains a strong ethos of respect for nature while utilising the latest technology. He has published his seven years of research under the title Disruptive Pattern Material. The past few months have seen Maharishi drop a few new capsules, such as the “White Tiger” and the “Upcycled in London” collection. The brand has now returned with a new collection for Fall/Winter 2017, which is full of cold-weather pieces and takes inspiration from global travel and 18th-century Japan and Vietnam in the '60s. In addition to the lookbook, Maharishi has released a campaign video featuring an exclusive piece of music by Richard Russell‘s Everything is Recorded project. You can pick up pieces from the collection now from the Harvey Nichols. Thanks to Maharishi for the images and videos.